In the Haggadah, the text that guides us through the Passover seder meal and accompanying rituals, we read the phrase, “With a strong hand and an outstretched arm.” The “outstretched arm” of the Passover seder usually refers to God and symbolizes redemption. Yet God is not the only character in the Passover story that extends her arms and has a part in the freedom story. When Pharaoh decrees that the first-born males of the Israelites are to be killed, Yocheved hides for baby son, Moses, for three months. Unable to keep him hidden any longer, she makes a small basket for him and sets him adrift in the Nile. Miriam, his sister, follows the basket along the river to see where he will land. Meanwhile, the daughter of the Pharaoh goes out for her daily bath with her attendants and sees the basket floating there and rescues him. She turns him back over to Miriam to find a wet nurse. What we don’t know is why she is out bathing? Why does she decide to rescue him? Why does she have enough faith to turn the baby back over to an Israelite mother? Does she know that the nursemaid is the baby’s mother? Is this a case of sacred deception where she suspects the truth? How could she have reached him all the way in the middle of the Nile? What is her name, and why is it missing along with these many other details? The Rabbis pondered these questions and came up with Midrashim, interpretive stories, to complete the text. One of the answers about how she was able to reach out to Moses was that her arms literally grew longer, an extra sixty cubits. She, like the Almighty, saved him, a child of the Hebrews, with an outstretched arm. This interpretation is a great teaching and serves as an example of working with interfaith families. Not only does the Pharaoh’s daughter reach beyond her self, her family, her attendants, her upbringing, but she also stretches beyond her comfort level to become something new, a mother. She adopts and welcomes a child of another background. She opens her heart and arms to raise a child of another faith in her home. She then turns to Miriam to ask her to find him a wet nurse. She knowingly stays engaged with his family of origin. For me, the Pharaoh’s daughter becomes one of the archetypical models of outreach. She is not afraid to face the consequences of her actions, defying her father and his evil decree. Her arms reach to embrace the stranger, and become even longer with God?s help! In other words, our actions of reaching out and inclusion, taking in those that are abandoned, set adrift, floating just out of reach, receive Divine support for this work. Just as God saves the Jews with an outstretched arm, we must recognize that outreach is what will deliver and save the Jewish people today. We must, as the Pharaoh’s daughter did, reach beyond ourselves, leaving our old beliefs behind, and embrace interfaith families and their children. She took in a child of a different heritage without much hesitation, just as many people of different faiths are raising Jewish children today. We reach out in many ways with outstretched arms, such as inviting interfaith families to our Shabbat dinners, making telephone calls, writing articles, coordinating wedding referrals, and by changing and challenging the attitudes in our community. This Passover season, invite an interfaith family to your seder table, extend your arms in welcome. It is said that because of her actions, the Pharaoh’s daughter never died but sits in Paradise near God’s throne. Her name is changed to Batya, which means “daughter of God” in Hebrew (Leviticus Rabbah 1:3). She merits eternal life; a privilege reserved for a special few. We should all be so worthy. Rabbi Geela Rayzel Raphael is a rabbi in private practice in the Philadelphia area. 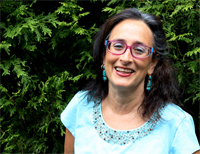 She has a specialty in interfaith weddings and welcomes couples to her home on Shabbat. In addition, Rabbi Rayzel is an award winning singer/songwriter. You can visit her at Shechinah.com.